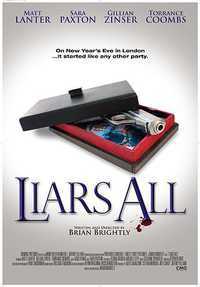 Liars All is a 2013 American psychological thriller film. It was directed and written by Brian Brightly, and stars Matt Lanter, Sara Paxton, Gillian Zinser, and Torrance Coombs. This webpage uses material from the Wikipedia article "Liars_All" and is licensed under the GNU Free Documentation License. Reality TV World is not responsible for any errors or omissions the Wikipedia article may contain.